Azure Stack Technical Preview 2 has just been released at Ignite!! This release provides new features for both tenants and administrators. Key Vault provides secure management of your keys and passwords for cloud apps. Allows for auditing and monitoring of key usage by apps and VMs. iDNS provides internal network name registration and DNS resolution without additional DNS infrastructure. Virtual Network Gateways provide VPN connectivity options to Azure or other on-premises resources. User Defined Routes allow you to route network traffic through firewall, security, or other appliances and services. Storage Account Shared Access Signature enable granular delegation of access to your storage services without having to share your full account key. You can deallocate and capture virtual machines, redeploy virtual machine extensions, and resize virtual machine disks. Billing and consumption APIs expose data on how your services are consumed. You can capture plans and offers in Resource Manager templates. 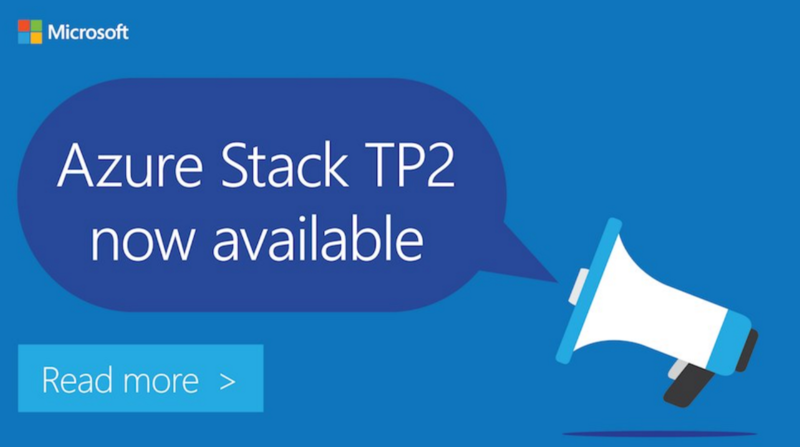 Delegated Providers enable resellers to offer your Azure Stack services to their customers. Reclaim unused tenant resources on-demand. Azure Stack Regions are a logical unit of scale and management within Azure Stack. In this preview, you can view resource consumption of network, storage, and compute resources by region. New monitoring capabilities available in the portal and APIs allow you to proactively view and manage alerts on your environment.